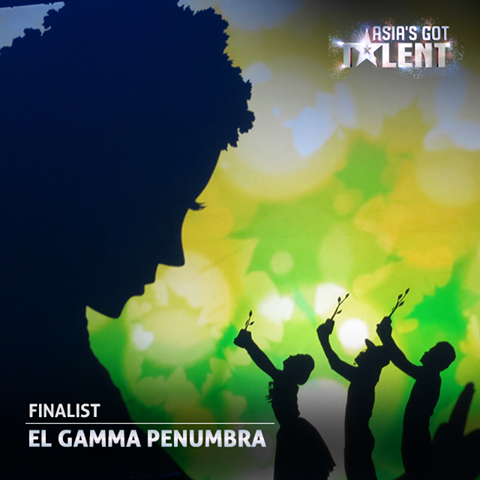 MANILA, Philippines - Filipino shadow play group El Gamma Penumbra got standing ovation from the judges on Asia's Got Talent grand finals performance night on Thursday, May 7 at the Marina Bay Sands in Singapore. El Gamma Penumbra, the two-time 'golden buzzer' recipient of the Asia-wide talent competition gave an important message about protecting the environment. “You know what really make me fell in love with you with your performance, the possibility of message that you put in is endless. Wonderful performance,” teary eyed Anggun Cipta Sasmi said. "Our job as entertainers is to entertain people, but if you can - if WE can - raise awareness on a subject that really matters..that makes our job really noble," Anggun added. "It's such a moving performance and very touching, very emotional. You guys are graet example and thank you guys for the message," Vanness Wu said. "Couldn’t. Agree. More! We are so proud to host amazing talents like El Gamma Penumbra, who use their moment in the spotlight to spread positive messages that can make a difference in the world. You are true role models, thank you!," Asia's Got Talent shared on Facebook. Aside from El Gamma of Tanauan City, Batangas, there are three other Pinoy acts in “Asia’s Got Talent” - the classical singer Gerphil Flores, 10-year-old singer Gwyneth Dorado and teen dance troupe Junior New System. Voting is now open and viewers can vote for their favorite acts anytime before 11:59 on Monday. There are 3 ways to vote: SMS voting (codes vary by country), Facebook Voting (Facebook desktop or Facebook mobile) and Asia’s Got Talent App Voting. For further instructions on how to vote, please visit the Asia’s Got Talent Voting Page - http://asiasgottalent.tv/vote/. The first-ever grand winner of Asia's Got Talent will be named next week, May 14 as it airs live the second part of finale episode.